Focusrite has added two more audio interfaces to its Scarlett range: the 18i8 and 6i6. Both of these feature the company's mic preamps and a variety of other connectivity options, but differ in the number of inputs and outputs that they offer. Specifically, the 16i8 is an 18-in/8-out device and the Scarlett is a 6i6 6-in/6-out box. The clues are in the names, really. Check out the details from Focusrite below. Both products will be available in June with prices set at £199.99 for the Scarlett 6i6 and £299.99 for the Scarlett 18i8. Focusrite is pleased to announce the introduction of two new members of its Scarlett range of USB 2.0 audio interfaces: the Scarlett 18i8 (18-in, 8-out) and Scarlett 6i6 (6-in, 6-out). Both are aimed at recording artists, producers and bands and differ primarily in their I/O configuration. Both feature award-winning Focusrite mic pres, designed specifically for Focusrite's computer music interfaces, and Focusrite's renowned precision 24bit/96KHz conversion for maximum transparency. In addition to Mac® and Windows® operation, both interfaces are compatible with iOS® devices like the iPad® (via the Apple® Camera Connection Kit - not included). The Scarlett 18i8 is the first interface from Focusrite to include four award-winning mic preamps. The first two inputs offer Mic/Line/Instrument on universal XLR/TRS while three and four offer Mic/Line capability on XLR/TRS. The 18i8 can also record up to four additional line inputs at the same time, making it perfect for recording an entire band live. An ADAT option allows the connection of external mic preamps such as the Focusrite OctoPre Mk II, extending the number of mic pres to 12. The Scarlett 6i6 is designed to allow recording on a smaller scale. 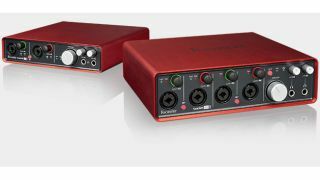 In addition to two Focusrite mic preamps it features a stereo line input, making it possible to capture, for example, vocals, guitar and a digital piano at the same time. Both models feature the signature Scarlett range unibody metal chassis for road-ruggedness, and the unique "signal halo" LED rings around the input controls that indicate green for a good level and red for overload. They also include two headphone outputs each with their own level controls; the headphone outputs on the 6i6 mirror the main and sub-outputs whereas on the 18i8 they are fully independent. Four award-winning Focusrite mic pres The best sounding interface in its class. Focusrite's 25-years of design experience underpins this new interface with four award-winning mic preamps. 18 inputs and 8 outputs All of the analogue and digital inputs you need for home multi-track recording. No need for breakout cables - every analogue input & output has a dedicated socket. Two independent headphone outputs each with a level control With two fully independent headphone mixes the engineer and the artist can both listen to their own mix at the level they need. Two award-winning Focusrite mic pres The best sounding interface in its class. The two award-winning mic preamps are products of Focusrite's meticulous approach to preamp design. 6 inputs and 6 outputs All of the analogue and digital inputs you need for home multi-track recording on a smaller scale. No need for breakout cables - every analogue input & output has a dedicated socket. Two headphone outputs with level controls With two headphone mixes the engineer and the artist can both listen to the mix at the levels they need. High quality 24bit/96KHz audio interfaces for Mac, PC and iPad Both feature professional conversion technology guaranteeing pristine audio quality and reliable synchronization on Mac, PC and iPad (or any iOS device via the Apple Camera Connection Kit - not included). Rugged metal unibody chassis Whether you are in the studio or on the road your Scarlett will not only look great, but also withstand the impacts sustained by a mobile recording rig. Unique gain halos for safeguarding your levels Unique gain halo indicators make it clear when you have a good signal for recording. When the halos are green you have a good level, and when they turn red it means you need to turn the gain down. Large main monitor control A large main monitor control knob keeps your volume levels right at your fingertips. Scarlett MixControl ultra-low-latency DSP mixer and router Scarlett MixControl provides a DSP mixer with flexible routing capabilities, intuitive one-click presets, and lower than 1.4 ms latency. Powerful software bundle Includes the Scarlett Plug-in Suite (Compression, Gating, EQ and Reverb for tracking and mixing), Ableton Live Lite, Loopmasters sample content and the Novation Bass Station analogue modelling synth plug-in.